The post-WW2 revolution in transport and logistics, which ushered in globalisation and transformed the world economy, was underpinned by one thing: the humble pallet. Make that two things: the humble pallet and the container. But for the moment, we’re talking about palletisation. As noted, pallets changed logistics forever by allowing the standardisation of materials handling equipment. The incredible panoply of objects that humans trade – large, small, heavy, light, strong, squishy, explosive and more – could for the first time be moved and stored in the same way, by the same equipment. All that was needed was a set of forks. So efficient is the pallet that today many companies use them not just for freight, but also for internal processes: moving items around the factory, loading them into machinery, storing them in the warehouse and so on. The standardised surface of the pallet allows smaller items to be tessellated together both horizontally and vertically, creating a stable logistical unit with a surprisingly large volume. Placing items on a pallet like this is called stacking, and it is commonplace in modern industry. Stacking is still mostly done by hand, because it requires precise, gentle placement to create a stable tessellated ‘stack’. Typically, this means building up ‘layers’ of items one at a time, until the stack is complete. As the stack is built, the ‘deposition height’ changes, layer by layer. This forces the person doing the work to perform a repeated series of stoops, reaches and stretches, all while carrying objects. Pallets are great, but stacking them is an orthopaedist’s nightmare. Repetitive biomechanical strains, such as those incurred by stacking pallets, are strongly associated with the development of lower back sprains and strains, as well as injuries to the shoulders, neck, hands and fingers. These musculoskeletal disorders (MSDs) are often debilitating, long-lasting, and impose a staggering financial toll: in Ontario in 2010, the average cost of a lost-time MSD was estimated at CAD$140,000. And as large as that number is, it excludes intangible costs: once an MSD injury has been incurred, it will often inflict a permanent toll on the victim’s lifestyle, happiness and job satisfaction. Additionally, the employer may suffer costs such as negative community perceptions. There must be a way to unleash the benefits of palletisation without incurring costs like these – and there is. The most obvious solution is automation, and indeed many larger companies have invested in robotic palletizing technology. The cost however remains prohibitive for most small and medium enterprises. Another solution – pioneered by Simpro in 1994 with the patented Quikstak “smart-stacker” – involves a hydraulic pallet stacker or lift table fitted with an adjustable infra-red scanning sensor known as the ‘magic-eye’. 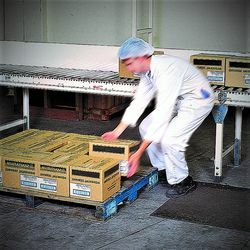 By automatically raising or lowering the pallet as the stack is built, the Quikstak® can maintain the ‘deposition height’ at an ergonomic level, depending on the person or task at hand. While the Quikstak® solution does still require manual stacking, it eliminates repetitive bending and stretching, dramatically reducing the risk of injury – for a fraction of the cost of a robotic palletiser. Simultaneously, the customer acquires a versatile fork-truck for use in dispatch, warehousing and logistics: once a pallet has been stacked using a Quikstak®, it can be simply driven away, loaded onto a truck, or stored high on the pallet racking. That versatility is probably why the Quikstak® was a hit in 1994, and why the updated range is still popular today. Palletisation is great – but with a Quikstak®, it stacks better for your business!